No one has ever been able to improve on the mousetrap or the wheel, but what about the coffee mug? After building a prototype and using it in his North Carolina home, Tigere Chiriga and his business partner, U.K. resident Dumi Ndlovu, raised $40,000 on Kickstarter last year and recently began shipping mugs to their backers, according to the company’s Facebook page. The design involves extending the mug’s handle past the base of the vessel and curving it underneath to create an attached coaster that keeps the hot part of the mug off any surface it is laid on. Chiriga says that the inspiration for the floating mug came from an innocuous piece of kitchenware. “I love the feel of warm porcelain as I’m sipping a hot cup of tea or coffee, so the mug needed to be made of porcelain while maintaining the unique design. It also needed to be functional while pleasing to the eye. With this is mind, the very next time I went to reach for a banana off the banana holder, the concept hit me like stain on wood. 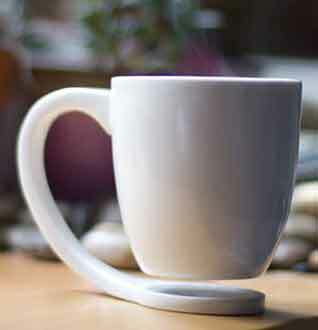 That’s when the floating mug concept was born,” Chiriga explains on Kickstarter. It’s a great idea, and the design is smart and wonderful, but at this point one floating mug will set you back $35.99 (U.S.). They've Created the Perfect Coffee Mug - Finally"